Description: At last you will reveal yourself to the Heroes of Lore. 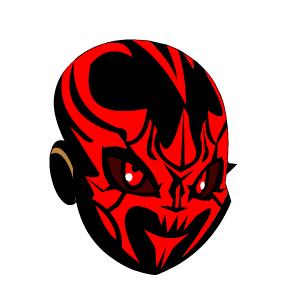 At last you will have your revenge in a color custom mask! Facepaint is Color Custom to Accessory Color. This item is a parody of the antagonist Darth Maul from Star Wars, and country music artist Garth Brooks. Garth Maul Mask and Hat. Thanks to Kienkai and Xia.